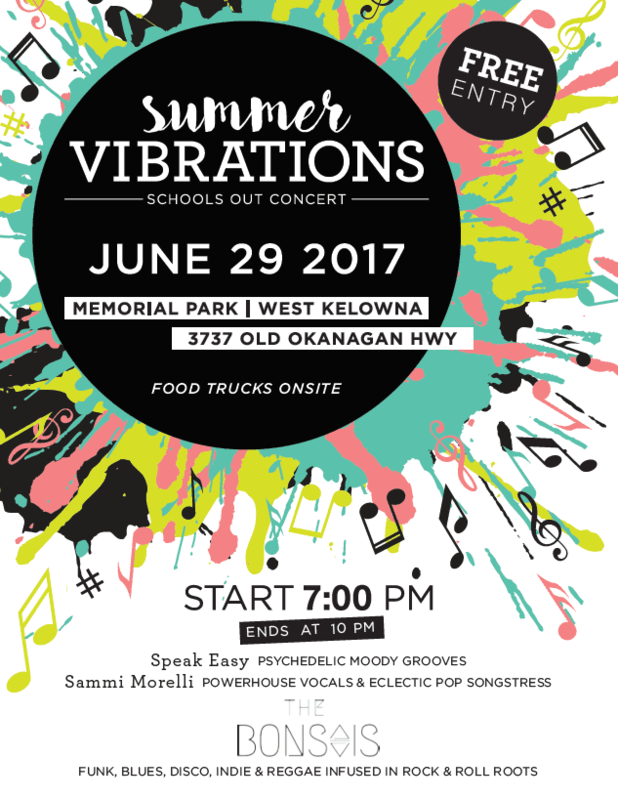 This year’s first concert at Memorial Park, Summer Vibrations on Thursday, June 29, is a school’s out celebration for West Kelowna. Everyone is welcome at the free outdoor concert in Memorial Park that will feature Speak Easy (psychedelic moody grooves), Sammi Morelli (powerhouse vocals and eclectic pop) and The Bonsais (funk, blues, disco, indie and reggae infused in rock and roll roots). 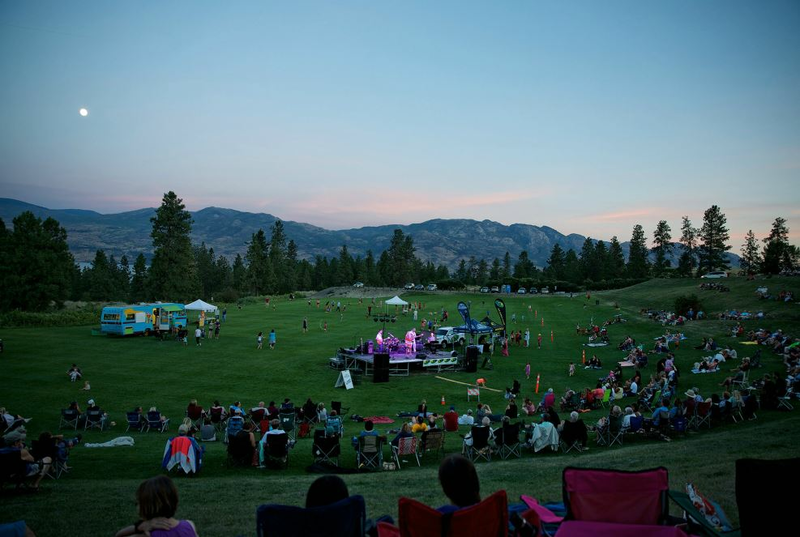 The concert starts at 7 p.m. in the Memorial Park Amphitheatre, 3737 Old Okanagan Highway. Memorial Park is located behind Johnson Bentley Memorial Aquatic Centre (JBMAC) at 3737 Old Okanagan Highway. If travelling north, proceed along Highway 97 (turns into one-way Dobbin Road through Westbank Centre) to Old Okanagan Highway. Turn right on Old Okanagan Highway and travel 250 metres. Park and JBMAC entrance is on the left. If travelling south, proceed along Highway 97 (turns into one-way Main Street through Westbank Centre), turn left onto Old Okanagan Highway. Proceed on Old Okanagan Highway and go straight through the intersection of Dobbin Road (Highway 97 northbound). Park entrance is 250 metres ahead on the left. Food trucks will be onsite. New this year, the Summer Vibrations concert is an addition to the free summer music programming in Memorial Park. This program is geared toward the youth of West Kelowna. 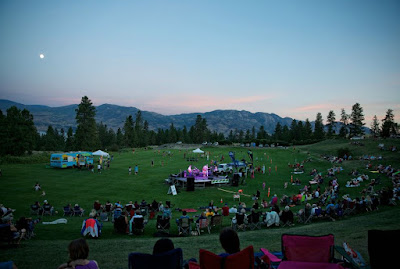 Music in the Park will kick off on July 7 with free, family friendly concert series running each Friday night during July and August. Music lovers will enjoy a variety of genres including country, pop, folk, opera and more. West Kelowna recreation staff will be in the park with some frame and costume fun. Parking is limited, particularly with no access to parking near the site off Gellatly Road due to the BC Forest Service temporary encampment. Attendees may wish to park in West Kelowna’s downtown area and walk to the site, or consider transit or carpool options to take in the concert. 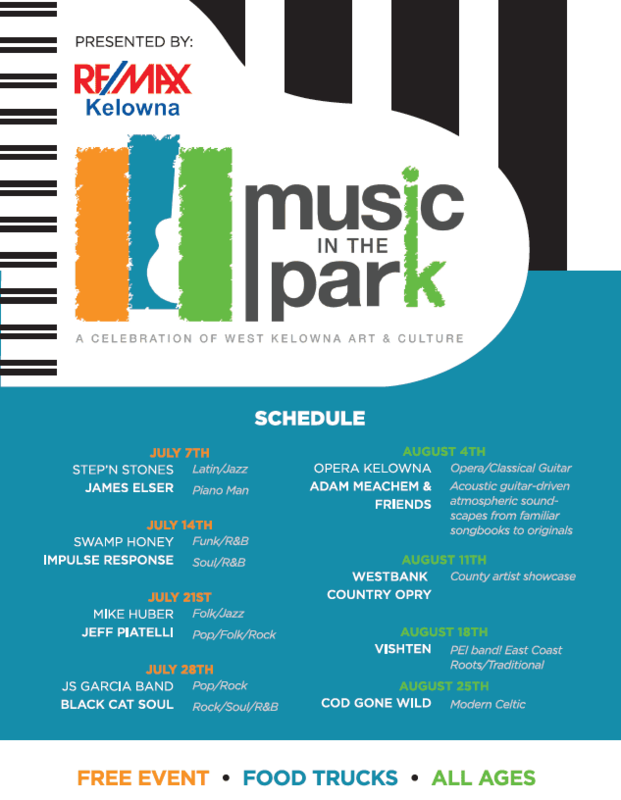 Connect with us through our website www.westkelownacity.ca/musicinthepark or find us on Facebook, Twitter or Instagram to get the full line up for this season’s Music in the Park. Summer Vibrations is produced and promoted by Creative Okanagan Artist and Event Development Society. The City of West Kelowna would like to thank the Summer Vibrations event sponsors: Remax Kelowna, New Horizon Productions, K96.3 Classic Rock and Twirling Umbrellas.